Last year, when Carson Wentz was coming back from a torn ACL, there wasn’t a lot of panic about when he might return. The Eagles had Nick Foles, the reigning Super Bowl MVP, to fill in. Foles is with the Jacksonville Jaguars now, and Wentz’s update on his back injury is at least worth paying attention to. Wentz, who hasn’t played since Dec. 9 due to a stress fracture in his back, said in a press conference Monday that he’s still healing. Wentz didn’t sound concerned about where he’s at in mid-April, but all eyes will be on his recovery as the Eagles offseason goes on. But he’s still not full strength. He is throwing and running a bit, though he wouldn’t get into specifics of what he can and can’t do. "It's still getting there. 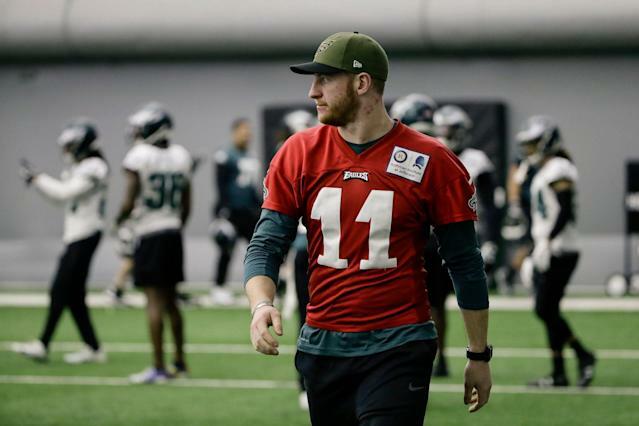 It's still getting there," Wentz said when asked if he was fully recovered. "Some of this stuff just takes time, but that's not really the main concern. It's just kind of how I feel. And I feel pretty good with where I'm at." Is this something to be concerned about? Probably not. The Eagles don’t play their first game for about five months. It would be pretty shocking if Wentz’s back issue is still a topic then. But the overall issue of his durability is becoming a concern. Wentz has been in the NFL three years and suffered a major injury each season. He has played through pain, and that’s commendable, but he needs to stay healthy. Wentz didn’t back away Monday when he was asked about his durability. Wentz was also asked about a contract extension that is likely to come sooner rather than later from the Eagles, and he said it was exciting to think about a long-term future in Philadelphia. But all the pieces need to fit together. The Eagles are going to feel better about that contract if Wentz can stay healthy. And Wentz needs to heal up from his latest injury before he can prove that.